Otis loves the children who visit him in his paddock. But what are THEIR lives like? 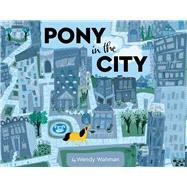 Come visit the city with this curious pony as he tries to find out! Otis wants to know all about the kids who ride at his stables. Do they sleep in stalls, too? Do they also get brushed and braided? The older ponies just flick their tails, snort, and ignore his questions. So, Otis heads to the city to see for himself. And as he looks at the happy, playful children all around town, he finds his answers. But then Otis realizes he’s sleepy, hungry, and very lost. Fortunately, some of his favorite friends come to the rescue and lead him back home . . . where the tables turn and the OTHER ponies have questions for Otis! Kids who love to ask “why” will relate to this sweet story about an adorable, inquisitive little pony. Wendy Wahman is the author and illustrator of many wonderful books about animals, including Don’t Lick the Dog (Henry Holt), A Cat Like That (Henry Holt), and Rabbit Stew (Boyds Mills, 2017). When she’s not grazing in the pasture, galloping through the meadow, or rolling in daisies, you’ll find her in her stall, drawing pictures and dreaming up horse tales. She lives in the Pacific Northwest.